AT&T has released TeleNav's turn-by-turn, voice-enabled GPS navigator for the iPhone at the expected price of $10 a month, proving that they're all going to be expensive, including TomTom's upcoming entry. 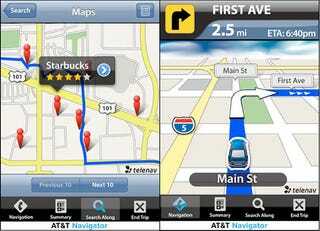 The software, which we've already seen on BlackBerrys and other phones from both AT&T and Sprint, includes the usual car GPS features, like voice-guided turn-by-turn navigation with a 3D view, rerouting, and 10 millions business and interest points. And while it's $10 a month, it also has automatic map updates. The best feature for the iPhone, however, is that you can cancel your subscription at any time and resume whenever you want. This may be perfect for people who only need a GPS while going on trips outside their area. Others may want to do a one-time payment—for probably around $100—if Navigon comes to the US, or if TomTom selects the pay-once, no-map-update method.